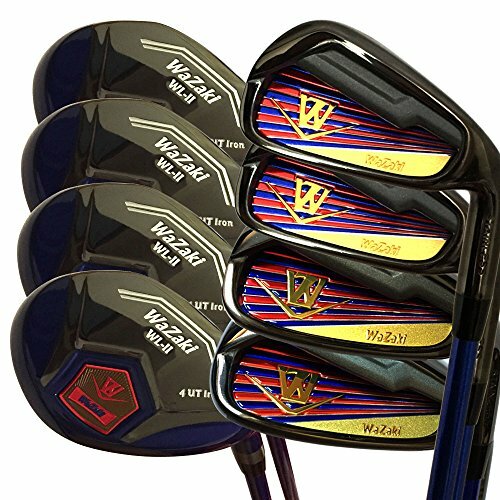 Combine with the WL-IIs hybrid irons(4-7)and Mx forged irons(8-s)deliver the breakthrough performance,this is WaZaki WL-IIs combo set. >An Innovative Shape with high ball Speeds. This is what the WaZaki WL-IIs Hybrid Iron brings to us.With the innovative technology designed to create faster ball speeds and more forgiveness.The new hybrid iron comes with a new incredible speed face and a casting body.This creates a low CG and added forgiveness. >With the progressive head Shape goes through the whole Mx forged iron set,two different steel materials Mx Steel(high strength stain steel)and soft iron are sequential utilized to longer and shorter irons,precision milled grooves and two-piece insert construction to deliver the remarkable combination of speed,forgiveness,distance and control. >We still applied bushikadna shaft in our WL-IIs Mx Forged Iron this time.There are three flex is in available,R,SR,S. A New Look with Traditional Japanese Black Finish Technology head. The new Speed face is a thinnest and different thickness made by thin, light and robust material. This WL-IIs hybrid iron face makes more speed over the face, increases distance, enlarges the sweet spot, and offers more forgiveness for off-center hits. The casting body promotes a lower forward CG location that provides high launch and low spin. We've included a progressive head tech construction in our WL-IIs Mx Forged Iron to provide the extreme balance of ball flight, playability for each iron. The offset and sole widths are engineered strategically to keen control and high-spinning shots in the short-irons. The center of gravity is positioned progressively lower from the highest-lofted to the lowest-lofted in each head to enhance feel and distance control in the short-irons. The precision milled WL-IIs Mx Forged Iron face elevates groove depth and width closer to the USGA limit. to produce more spin on every swing. Two-Piece insert construction goes through the set to save significant weight that¡¯s repositioned in strategic places in the head to create more forgiveness and easier launch. A piece of the polyurethane Layer positioned behind face absorbs unwanted vibration for great feel.